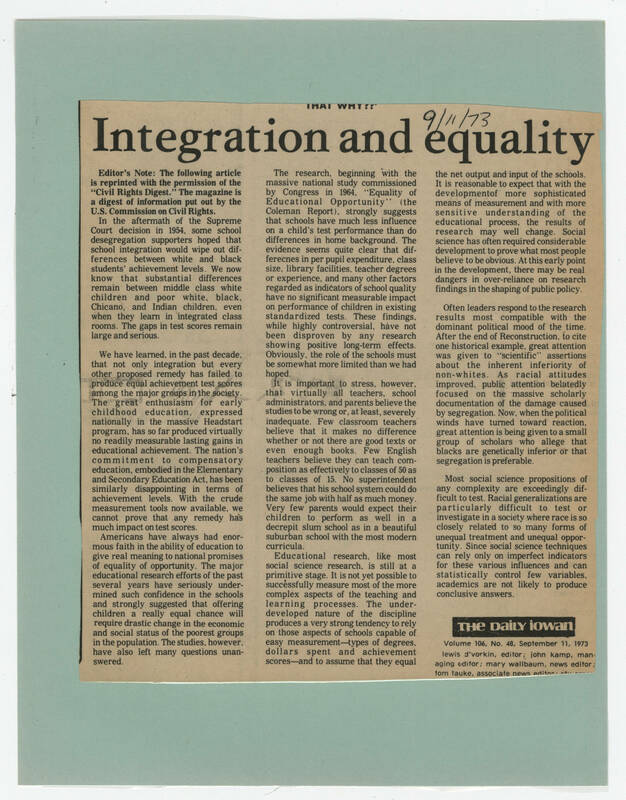 9/11/73 Integration and equality Editor's Note: The following article is reprinted with the permission of the "Civil Rights Digest." The magazine is a digest of information put out by the U.S. Commission on Civil Rights. In the aftermath of the Supreme Court decision in 1954, some school desegregation supporters hoped that school integration would wipe out differences between white and black students' achievement levels. We now know that substantial differences remain between middle class white children and poor white, black, Chicano, and Indian children, even when they learn in integrated class rooms. The gaps in test scores remain large and serious. We have learned, in the past decade, that not only integration but every other proposed remedy has failed to produce equal achievement test scores. The great enthusiasm for early childhood education, expressed nationally in the massive Headstart program, has so far produced virtually no readily measurable lasting gains in education achievement. The nation's commitment to compensatory education, embodied in the Elementary and Secondary Education Act, has been similarly disappointing in terms of achievement levels. With the crude measurement tools now available, we cannot prove that any remedy has much impact on test scores. Americans have always had enormous faith in the ability of education to give real meaning to national promises of equality of opportunity. The major education research efforts of the past several years have seriously undermined strong confidence in the schools and strongly suggest that offering children a really equal change will require drastic change in the economic and social status of the poorest groups in the population. The studies, however, have also left many questions unanswered. The research, beginning with the massive national study commissioned by Congress in 1964, "Equality of Education Opportunity" (the Coleman Report), strongly suggests that schools have much less influence on a child's test performance than do differences in home background. The evidence seems quite clear that differecnes in per pupil expenditure, class size, library facilities, teacher degrees or experience, and many other factors regarded as indicators of school quality have no significant measurable impact on performance of children in existing standardized tests. These findings, while highly controversial, have not been disproven by any research showing positive long-term effects. Obviously, the role of the schools must be somewhat more limited than we had hoped. It is important to stress, however, that virtually all teachers, school administrators, and parents believe the studies to be wrong or, at least, severely inadequate. Few classroom teachers believe it makes no difference whether or not there are good texts or even enough books. Few English teachers believe they can teach composition as effectively to classes of 50 as to classes of 15. No superintendent believes that his school system could do the same job with half as much money. Very few parents would expect their children to perform as well in a decrepit slum school as in a beautiful suburban school with the most modern curricula. Educational research, like most social science research, is still at a primitive stage. It is not yet possible to successfully measure most of the more complex aspects of the teaching and learning processes. The underdeveloped nature of the discipline produces a very strong tendency to rely on those aspects of the schools capable of easy measurement--types of degrees, dollars spent and achievement scores--and to assume that they equal the net output and input of the schools. It is reasonable to expect that with the developmentof more sophisticated means of measurement and with more sensitive understanding of the educational process, the results of research may well change. Social science has often required considerable development to prove what most people believe to be obvious. At this early point in the development, there may be real dangers in over-reliance on research finding in the shaping of public policy.